I have a family of doughnut addicts. They are all addicted to those fried rings of deliciousness. Living in North Carolina we are fans of Krispy Kreme, they are a North Carolina favorite originating from Winston Salem. Any Krispy Kreme fan knows that while yes, you can buy their doughnuts most anywhere from gas stations to grocery stores the best place to buy them is at their store when the light is on. This means they are hot and a fresh batch is ready. Our local Krispy Kreme store is on the other side of town so my family doesn’t get to enjoy their hot and tasty doughnuts too often but that is ok because I can make our own. Doughnut making is in my blood, I come from a family of doughnut makers from my mom to my grandpa. I have made doughnuts for years but when I became gluten free, I stopped. Until recently the last time I had a doughnut was when my family visited Disney World in 2014. 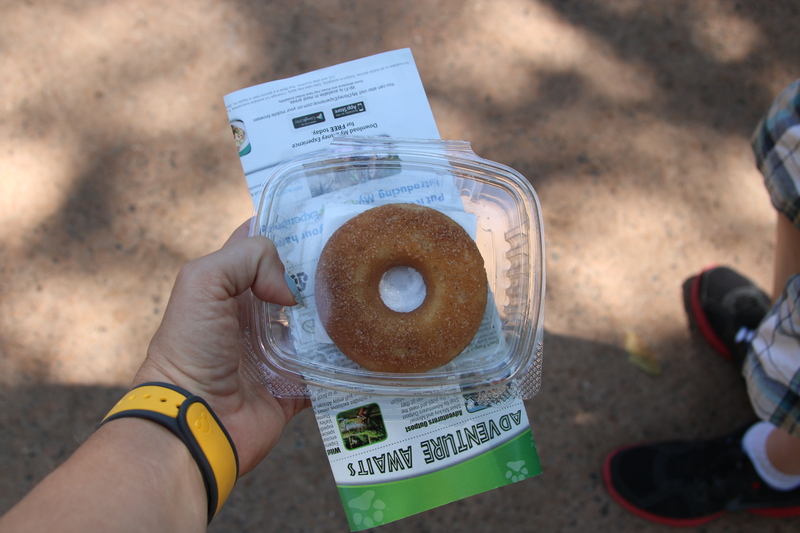 It was a doughnut but honestly nothing special or memorable. I had just found a gluten free doughnut. Something anyone that is gluten free knows is an amazing feat in itself. Since then I have made and make on a regular basis donut muffins and as delicious as those muffins are and help curb those doughnut cravings, I knew I needed to try to make my own still. I finally made my own doughnuts, just in time for the New Year too. My family needs all the lucky New Years Foods that they can get. 2018 is going to be a big year full of changes for my family. I have learned that many gluten recipes work really well with gluten free flour. The key for me has been finding a good gluten free flour blend. Every gluten free person has their favorite brand and mine has been Cup 4 Cup. This is NOT an ad for them at all, just what works best for me. Recipes I have on my blog can be made with regular all purpose flour or a gluten free blend. This doughnut recipe is one that I have made many times over the year with regular All Purpose Flour. I was a little nervous at first, for some reason I thought these gluten free doughnuts were going to disinegrate as soon as I placed them in the oil. Why I thought this, I have no idea other than I was making them gluten free. They didn’t dissengrate and they turned out beautifully. They were delicious and addictive. My husband couldn’t stop eating them and before I knew it they were all gone and I needed to make more. What is your favorite gluten free treat? In a medium bowl, cream together the shortening and sugar until smooth. Beat in the egg and vanilla until well blended. Sift together the flour, baking soda, and salt; stir into the sugar mixture alternating with the vinegar and milk. Roll dough out on a floured surface to ⅓ inch thickness. Cut into doughnuts using a donut cutter. Let stand for about 10 minutes. Heat the oil in a large deep skillet to 375 degrees F (190 degrees C). Fry doughnuts in the hot oil until golden, turning over once. Drain on paper towels. Dust with confectioners' sugar or cinnamon sugar or frost with icing while they are still warm, and serve immediately.